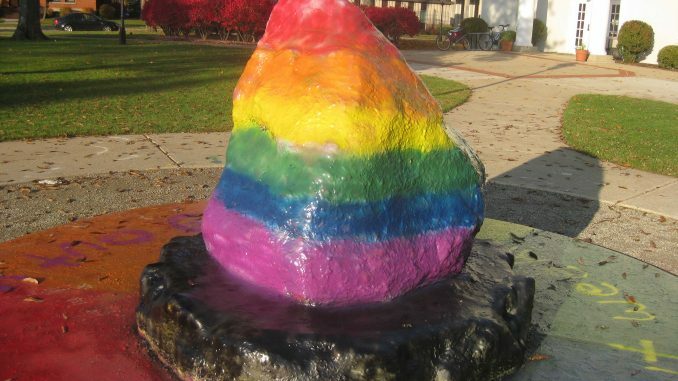 The third week in October is Coming Out Week at Albion College. This week provides an opportunity for Albion students of various orientations to come together in support of justice and equality. Kate Tonge, president of LGBriTS, a group for transgender students and students on campus with various sexual orientations, highlights many exciting events for Albion students to get involved in during this week. On Monday, there will be a speaker on asexuality at the Bobbit Auditorium. Continuing with the theme of discussion, there will be a panel on Tuesday consisting of students and professors, who will share their experiences with students about issues and experiences on campus regarding this topic. All questions at this event will be anonymous. One of the more inspirational events of the week is the vigil on Wednesday night. According to Tonge, people will gather around the rock to honor transgender women of color, who are the most targeted group in society. This gives the Albion community a time to both grieve and come together. For Thursday, there will be a screening of the movie How to Survive a Plague, a documentary regarding the AIDS crisis of the 1980s. It is seen through the perspective of LGBTQ activists. The Friday of Coming Out Week, Albion will feature its very own drag show, co-sponsored by Union Board and LGBriTs. An informational meeting will be held for students who are interested. This will also be a charity event, as tips will be collected for the Ruth Ellis Center which is based in Detroit. The week ends with LGBriTS hosting Albion’s Pride Prom, which is open to all students. The Pride Prom, according to Tonge, is an event to support, affirm and to have fun. LGBriTS meets Thursday nights at 7 p.m. in the Umbrella House. They are actively seeking participation for this special week. – The original article implied that Coming Out Week is celebrated on campuses nationwide during the third week of October. In fact, different campuses choose different weeks. Albion College’s clebration is being held this week. – The quotation marks ahve been removed from the third paragraph. While the information is factually correct, Kate Tonge denies having provided it in the interview. – Tonge contends that what was originally quoted in the fourth paragraph was not said verbatim. The quote has been paraphrased in revision. -The original article stated the the Drag Show event was sponsored by Union Board; it was in fact co-sponsored by Union Board and LGBriTs. LGBriTs still hosted the main event.